"You're going to Burning Man? Do you really want to spend a week in the desert with a bunch of smelly hippies?" This was a pretty common reaction when I told people of my plans to attend the annual festival in the middle of Nevada's Black Rock Desert. If I could think better on my feet, I likely would have responded such: "Actually, I'm not going to spend a week in the desert with a bunch of hippies - I'm going to Burning Man." Call this an unfair generalization if you must, but I don't believe that hippies, as a whole or gathered in a group, have the requisite resources, ingenuity, and organizational skills to put something like Burning Man into effect. It's a week-long gathering of 50,000 people (think a sellout crowd in Dodger Stadium) in a dangerously harsh environment (think that dry, cracked land from car commercials where absolutely nothing grows) with the sole purpose of throwing a gigantic party and having a shared experience. 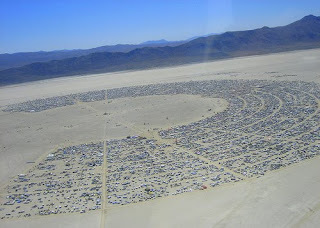 No, the people who plan and populate Burning Man are far from hippies. The best way to describe them is with the word they use to describe themselves: Burners. And I am now proud to count myself among their ranks. 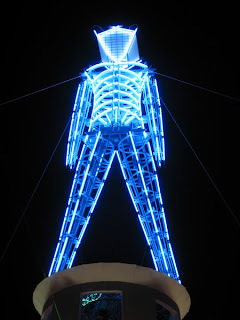 This is an exclamation people are likely to shout at you upon entering Burning Man. Although it only happens once a year, there's something about the playa (that's the name for the dry lake bed of the desert, despite it hardly resembling a beach) that just exudes comfort and a feeling of safety. The official line that I've been spouting to curious parties is that it's an Exercise in Temporary Community. They make sure to emphasize community rather than society, because the whole experience truly is built on people (and by people) gathering together just for the sake of sharing something with each other. There's no commerce between burners, and even bartering is discouraged, the preferred focus being on the free giving of gifts. 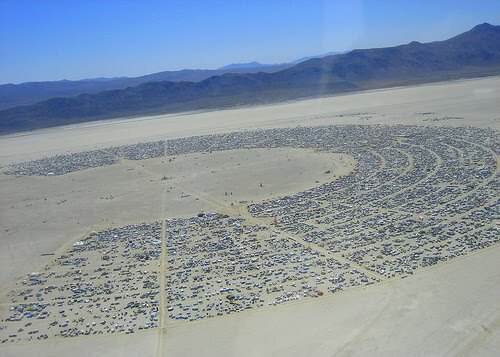 There is certainly no shortage of goodwill at Burning Man. This is the closest thing to a Burning Man proverb that I've heard, and it reflects both the sense of goodwill between Burners and the uncanny sense of things just working out for the best. If you're dark, someone will offer you a light. If you're thirsty, someone will offer you a drink. If your skin is dry and cracked, a truck will drive by spraying non-potable water out the back to keep the dust in check. (This is a rare but welcome occurrence.) If you're looking for anything in particular, you're likely to find it on the playa, because pretty much anything that can be built in or transported into the desert will be there. Full-sized yachts mounted on a truck bed driving around the playa. A five-story tall (at least) statue of gigantic Tetris blocks, one interminably poised above the others. A sprawling human ant farm through which you can climb and crawl. A magic carpet on wheels mounted with a hookah for whoever can squeeze onto it. And that doesn't even scratch the surface. This party is literally made of the stuff of dreams. And it gets even more dreamlike at night, when everything is lit up neon style, and as far as the eye can see, from horizon to horizon, there are attractions big and small, mobile or stationary, just waiting to be played upon, danced in front of, or enjoyed from any angle possible. Add to that the constant hum of the dirtiest bass you'll ever hear, blasting from three-story tall speakers, and you've got an idea of a hint of a glimpse of a thought of what it kind of sort of feels like to be there. 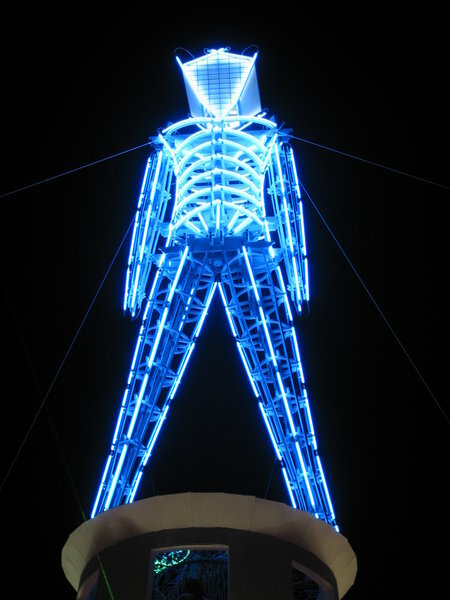 Not to sound trite, but there literally aren't any words to describe what Burning Man is like. One of our camp members described it as Venice Beach, but without the beach and without the tourists. Everyone is there because they want to be, and everyone who's there has made all the necessary preparations and sacrifices to be there. Everyone participates and no one's hesitant to ask for something, provide something, or just start up a conversation. The radical freedom of the playa extends into what people wear, what they say, how they act, and generally into however they want to express themselves. And until that man burns to the ground - accompanied, incidentally, by a fireworks display that puts to shame every grand finale of every Fourth of July fireworks display I've ever seen, combined - every Burner is joined in a bond of community that affects worlds and alters lives year-round.